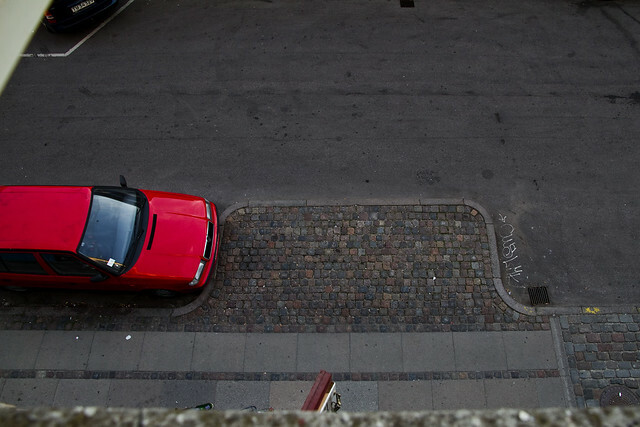 As we've mentioned before here on the blog the City of Copenhagen decided a number of years ago to quietly remove 2-3% of city space designated for cars and return it to people. A little added initiative to accompany the regular developments of bicycle infrastructure and pedestrian space. It is often done so quietly that it even sneaks up on those of us who know to look for it. I've been down this street a billion times. Then, looking out of my friend's flat window down at the street I noticed a little spot of reclaimed land. A single car parking space taken over by a subtle sidewalk extension. It's a side street with little through-traffic so it is hardly an in-your-face affront to car parkers everywhere. But it's nice. It serves absolutely no function whatsoever in its current state. To the right is the entrance to a back courtyard where people come in an out on bicycles or not. I would bet that bike racks are planned for it, as there are none right outside these buildings. Until then it remains a fine, almost anonymous symbol of "2-3%".